I came home with a scratchy throat yesterday and thought this would be the perfect time to make baesuk especially with the rise of the flu epidemic and the freezing temperature in the teens. 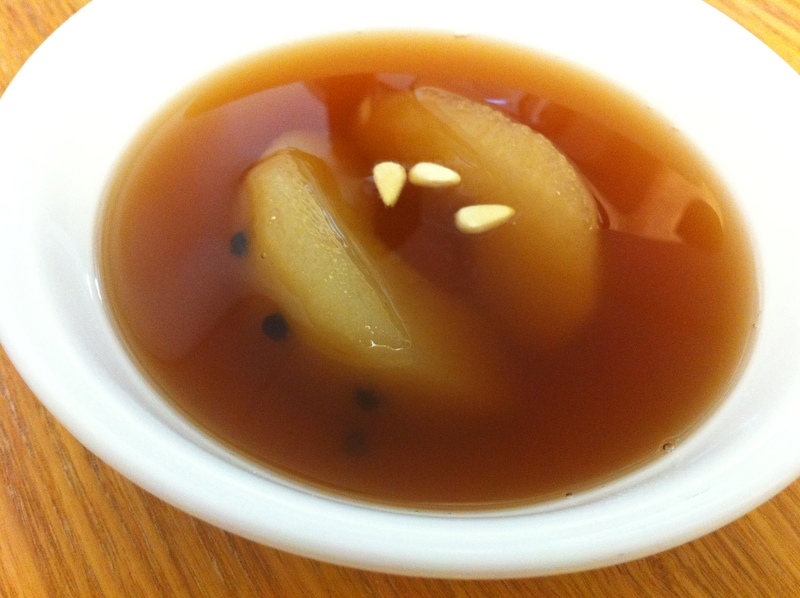 You can serve this warm or cold with the pear as a dessert or snack or just as tea with only the liquid portion. 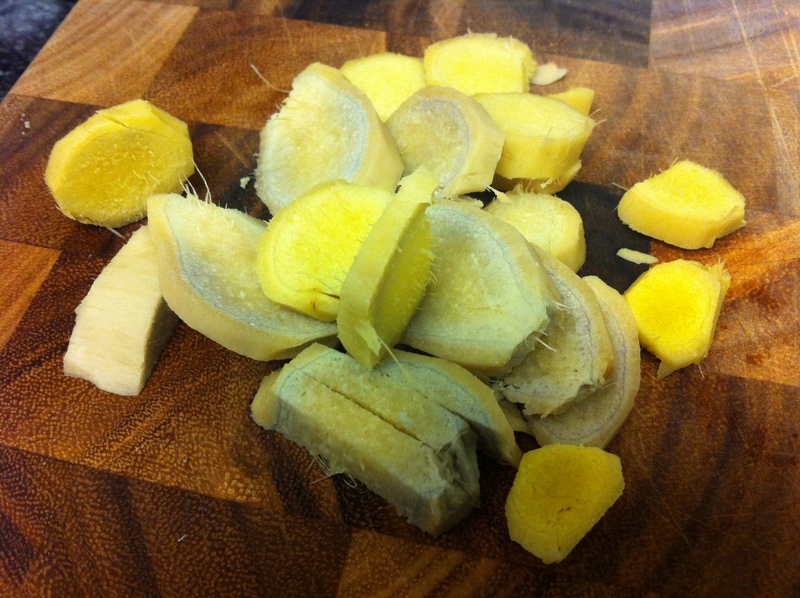 Peel the ginger and cut into small slices. Add the ginger into 8 cups of water and bring it to a boil. Lower the heat to medium-low and brew for 30 minutes. While the ginger is brewing, mix the remaining water with 1 tablespoon of sugar. 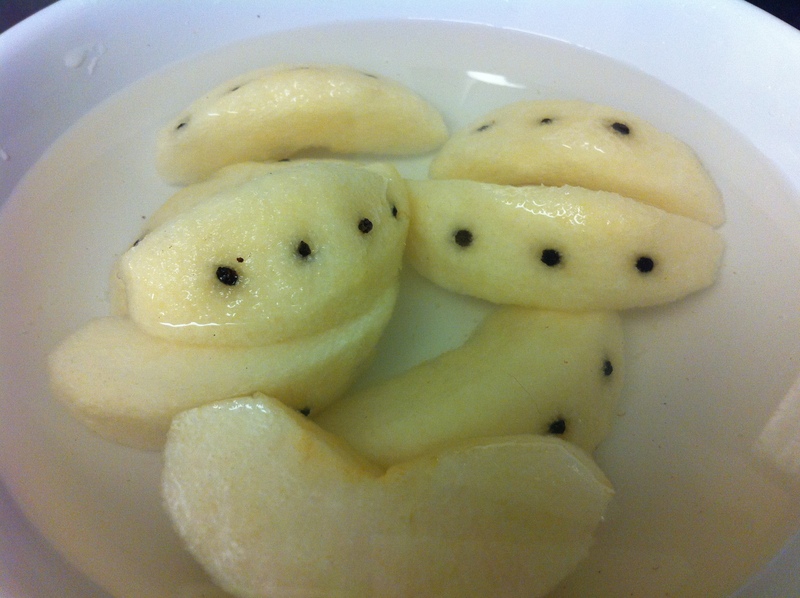 Cut the Asian pear into 8 slices and place it into the sugared water. 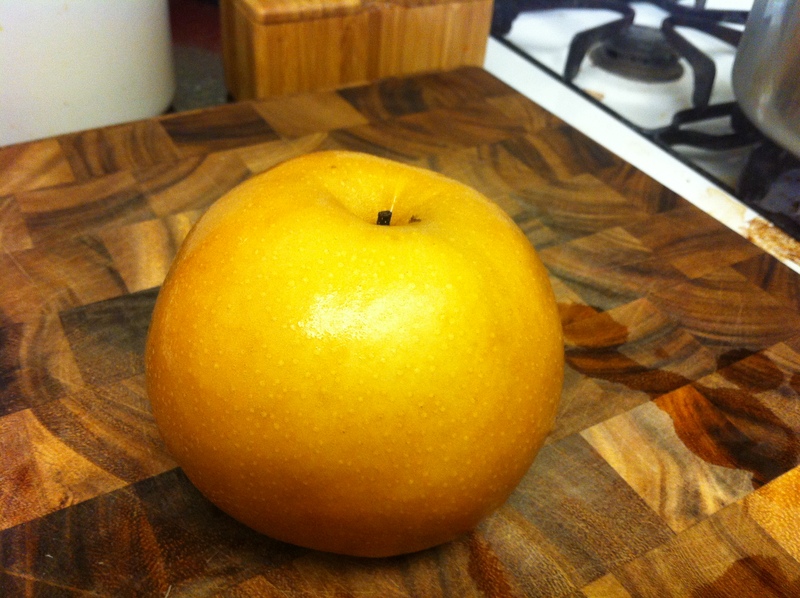 This prevents the browning of the pear slices. Push in 3 peppercorns into the sides of each pear slice. 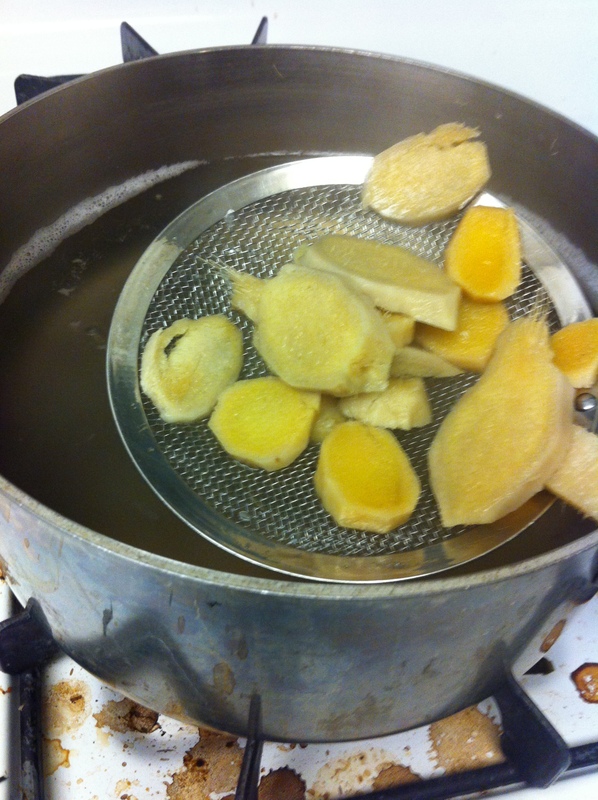 After the ginger is finished brewing, take out the ginger pieces by using a sieve or a strainer. 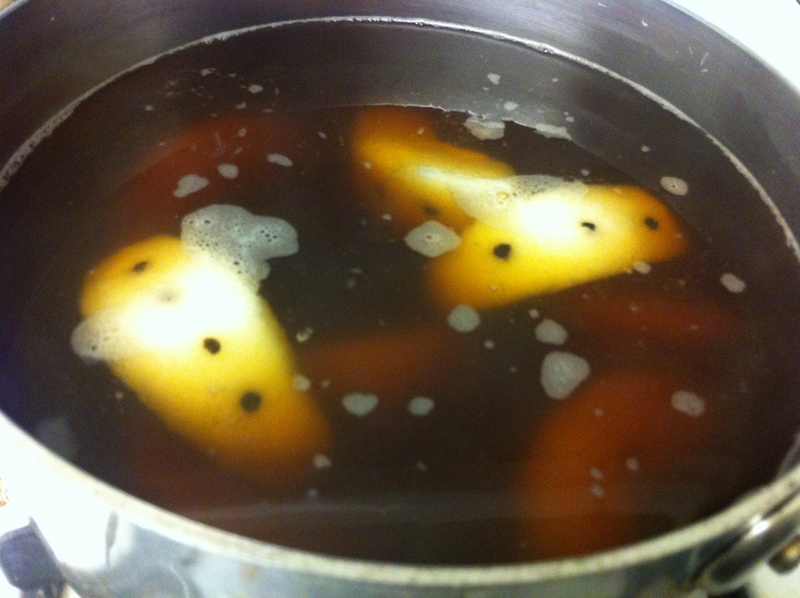 Drain the pear slices and add them into the pot where the ginger was brewing with 1/2 cup of light brown sugar. I had dark brown and white granulated sugar so I used 1/4 cup each. Simmer for another 10 minutes. You can add honey if you like it sweeter. Serve it warm or cold and optionally can garnish with pine nuts. *If you have children who might not like the taste of black peppercorns, you can take them out before serving or omit it completely from the cooking process. This entry was posted in Dessert/Snack, Tea, Vegan/Vegetarian Options and tagged Asian Pear, Cold Remedy, Ginger, Honey, Tea by gangnamkitchen. Bookmark the permalink.